After decades of Cold War sanctions, a thaw in U.S.-Cuba relations opens opportunities for joint research and exchanges. Susana Olivares Rieumont and David Graham offer proof that nothing—not an economic embargo, geopolitical tension, or lack of funding, and certainly not Graham’s “pretty poor” Spanish—need stand in the way of a partnership between researchers with a shared passion. For Olivares, a chemist at the Higher Institute of Technologies and Applied Sciences (INSTEC) in Havana, and Graham, a Canadian-born civil and environmental engineer then at the University of Kansas, that passion was the environment, particularly threats to water quality. Ten years before President Obama broke through a half-century of Cold War hostility to resume diplomatic ties with Cuba’s Communist government, the two academics teamed up to publish their first study of contaminants in Cuban waterways. Other joint projects followed, including groundbreaking work linking river pollutants with resistance to antibiotics. Look for more researchers to follow Olivares and Graham’s pioneering example as U.S.-Cuban relations improve and institutional ties expand. From environmental engineering to biomedical technology, construction, agriculture, and energy, the potential for mutually beneficial collaboration is broad. While starved for advanced equipment and research funding, Cuba has made notable advances in certain areas—particularly biomedical technology. 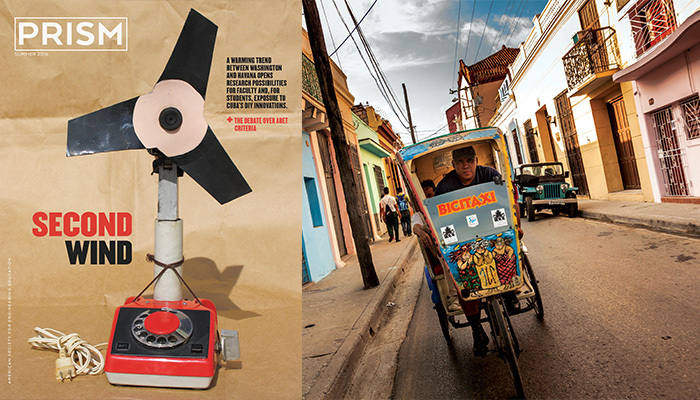 And Cubans bring unique skills, borne of decades of deprivation following the U.S. trade sanctions, that give new meaning to “design within constraints.” Common among them is an extreme DIY ingenuity that keeps 1950s-era cars rolling, electric fans turning with the help of Soviet-era washing machine motors, and a visitor’s iPhone repaired. Similar workarounds can be found at Cuba’s top technological institute, where the electrical machinery lab’s demise led instructors to conduct virtual labs or have students take apart and reassemble an old motor. A Caribbean model of top-notch hurricane preparedness, Cuba also specializes in low-cost technology and in translating research results quickly into a public benefit—an area where American academics often struggle. It’s hard to overstate the opportunities this thaw in U.S.-Cuba relations represents. Since 1960, a year after Fidel Castro overthrew the dictatorship of Fulgencio Batista and expanded ties with the Soviet Union, the United States has restricted everything except medical supplies and food in an effort to isolate the Cuban government economically and deprive it of American dollars. The sanctions were imposed by the Eisenhower administration after Cuba, responding to the refusal of American-owned firms to process oil purchased from the Soviet Union, nationalized refineries and raised taxes on U.S. imports. Legislation passed in the 1990s requires the embargo to be maintained as long as the Castro regime remains in power. While different administrations have loosened or tightened enforcement, reflecting the level of tension between the two governments, the embargo continued to restrict travel and commerce. Congress has not rescinded the embargo, but already, faculty and students are taking advantage of eased U.S. Treasury Department restrictions and renewed diplomatic ties to satisfy generations of pent-up curiosity about America’s close neighbor to the south. Some Cuban institutions already are inundated with proposals for exchanges, with the University of Havana alone having received some 1,000 by late 2015. Most academic connections to date have formed around culture and the arts, disciplines that don’t depend on up-to-date laboratory equipment—which Cuban universities generally lack—or easily available Internet access. Examples are Tulane University’s Cuban and Caribbean Studies Institute (CCSI), established in 1997, which boasts the largest undergraduate exchange program in Cuba and includes a graduate research pilot, lectures, and musical events, and the University of Alabama’s Center for Cuba Collaboration and Scholarship, which dates to an Alabama-Cuba Initiative begun in 2002. Cubans, however, want to expand exchanges into technical fields, among them health, agriculture, renewable energy, and water. At the University of Havana, for instance, “the rector is not only an engineer, he is very eager to get away from all the culture-language exchanges to focus on the STEM fields and what he calls, in his engineering ways, ‘really substantial exchanges,’” says Ana M. López, CCSI’s director. Literature, history, and film were the main pursuits of a 2004 University of Kansas faculty trip to Cuba initiated by Andrew Dubecki, a scholar of Latin American and Spanish poetry who headed KU’s international programs. “And then there was me,” Graham recalls—the lone academic from a scientific field. He didn’t know anyone in Cuba, but reached out beforehand to Kenneth Hall, a graduate school mentor at the University of British Columbia, who put him in touch with Olivares. She had previously worked with Albert Page, now an emeritus professor of geology at the University of California, Riverside, whose help she says “was essential to establish our analytical methodologies.” At the time of Graham’s trip, she was looking for a collaborator for a research project on heavy metal pollution of the Almendares River, which flows through Havana. Used for irrigation and fishing, the Almendares also flows above a groundwater basin that supplies nearly half the capital’s drinking water. Graham visited her institute, delivering a lecture on water pollution resulting from pesticides and antibiotics, and offered to collaborate with her team in publishing its work. Until then, very little had been published on pollution studies in Cuba, Olivares tells Prism. A partnership was born. “We had techniques they weren’t using. They had environmental situations we could learn from,” Graham says. Their first joint article appeared in an Elsevier journal, Water Research. As of early April, 2016, it had drawn 139 citations, contributing to studies of such river systems as the Danube, Tigris, Euphrates, and Yangtze. After documenting heavy metals in river sediment, the scholars proceeded to find them in water hyacinths. Moving north to the Sagua la Grande River, they found evidence linking mercury in fish to chemical-plant discharges. Collaboration continued after Graham joined Newcastle University, in the United Kingdom, where he is now Professor of Ecosystems Engineering, and started to pursue environmental causes of resistance to antibiotics. In the United States, such resistance had been historically blamed on overuse of antibiotics in agriculture and medical prescriptions. Graham wanted to find out if industrial pollutants could also be a factor. Cuba presented an ideal test-bed: a nation with industrial pollution problems and increasing cases of multidrug-resistant bacterial infections, but sparing in its use of antibiotics in medicine and agriculture. Olivares, Graham, and their team returned to the Almendares, where they took samples of water and sediment in areas with heavy metals, pharmaceutical wastes, and untreated sewage. Olivares and Graham had published their previous joint work outside the United States, wary of bumping up against the U.S. embargo. But Graham was intent on getting their AR research published in a discipline-specific American journal, which would carry more influence within the United States. The first U.S. journal he approached with the new 2008 work did not want to take the risk. He then submitted it to the American Chemical Society’s Environmental Science & Technology. The editors didn’t answer right away, but eventually “said ‘yes’ as long as the science is good. To be honest, it was,” Graham recounts. Published in 2011, it has drawn some 100 citations. The U.S. embargo not only made publication more complicated, but also scared off sources of funding and restricted access to supplies, Olivares and Graham say. “Often, Dr. Graham’s students came to Cuba with a suitcase full of small items for their research,” Olivares recalls. With the 52-year “blockade,” as Cubans call it, still in force, U.S. research agencies can fund only the American side of a joint research project with Cubans. However, foundations and philanthropies are able to fund the Cuban side of such a project, according to the State Department. A recent agreement on marine life protection between the National Oceanic and Atmospheric Administration and its Cuban counterpart, for instance, encompasses joint research but states: “Each Participant intends to arrange funding for the costs associated with any travel or other activities for its own staff.” Even if a U.S. agency were willing to fund a Cuban researcher, says Valdes-Sosa, the Cuban government would refuse to accept it while the overall sanctions remained in place. Absence of funding hasn’t prevented researchers with common interests from finding willing partners—either through referrals, as in Graham’s case, or serendipity, as was the case with NOAA meteorologist Anthony Arguez. The Miami-born son of Cubans who left the island in the early 1960s—his father by boat—Arguez sought out Cuban experts when he became lead editor in 2007 of State of the Climate, published by the American Meteorological Society. He hoped to bolster the publication’s reporting with more data from Latin America. A year earlier, his father had told him about a first cousin in Cuba who was also a meteorologist, so Arguez Googled his relative, Moisés Luciano Amaro Argüez, to invite participation. Given the Bush administration’s hard line, “contacting someone in Cuba was not something I did without hesitation,” he recalls, adding that he used his personal email account. When his cousin replied, Arguez discovered from his title that he was a director of the Cuban meteorological agency. And he was willing to collaborate. “He said, ‘Yeah, we should totally do that,’ ” says Arguez. Steven Jones’s Cuba connection emerged in 2012 at an Olive Garden in Tuscaloosa Ala., and a conversation with a faculty member from José Antonio Echeverría Higher Polytechnic Institute (CUJAE), Cuba’s top technology institute. The professor was among 20 Cuban academics invited to lecture at the University of Alabama. Five visits to Cuba later, Jones, a UA associate professor of civil, construction, and environmental engineering, is about to lead eight students for a month in Cuba together with colleague Derek Williamson. If the trip works out, Jones hopes to expand the month into a semester-abroad program, perhaps including other U.S. engineering schools. While at CUJAE, the Americans will be exposed to a culture that prizes a close link between professor and student, and project-based learning. “In Cuba, they have tried to reduce the student-teacher ratio. Now it’s down to 30 to 1, so that the teacher can have a more direct approach to the students. You know the very relationship is different,” Yorlandys Salgado Duarte, a 2013 CUJAE electrical engineering graduate now teaching in the math department, tells Prism. “Every year they have a thing they call comprehensive project, which brings together many subjects and takes a pragmatic approach on the things you do.” In electrical engineering, for example, students might design lighting systems for a household or wire a water pump. For the past decade, CUJAE has emphasized workplace-based research projects and immersive professional experiences over exams. Líber Mesa Duran, a professor of chemical engineering, for example, did his third- and fourth-year internship at the University of Havana’s synthetic antigen laboratories, where he also did his plant design project and graduate thesis. He worked at the labs after graduating in 2010, since there were no openings at CUJAE. “We have only the very basics,” says Mesa. To make up for the “very deteriorated” condition of the chemistry lab, students in chemical-reactions engineering or reactors design must conduct many of their lab practices virtually, on software, or by visiting oil refineries and other industrial facilities. Many of these sites have engineering professors and researchers working there who can guide students through both labs and professional training. Whereas a UA engineering student might pick a major with an eye on the job market, his or her Cuban counterpart is likely to move in the direction of government priorities, having to adjust if these change. This happened to Yasser Iturria Medina, who trained as a nuclear engineer at the Higher Institute for Nuclear Sciences and Technology in Havana when Cuba still had hopes of developing nuclear power with Russian and international help. After the government abandoned those plans, Iturria shifted as a postgraduate to nuclear medicine and then to neurophysics. Valdes-Sosa has been ready for years. Thanks in part to his efforts, U.S.-Cuban information sharing has progressed as far in neuroscience as in any other field. An urbane dual citizen, he seems born to the bridge-builder’s role. Reared in Chicago by Cuban parents—a doctor and an English teacher—he returned to Cuba at age 11 with his family, their route the opposite of the one traveled by many Cuban professionals after Fidel Castro took power. Trained in mathematics and medicine at the University of Havana, he has spent the decades since leading research at the intersection of neuroscience, computer science, and electrical engineering, developing new brain-mapping and diagnostic techniques. Valdes-Sosa co-founded what is now the Cuban Neuroscience Center, with a computer donated by New York University neuroscientist Erwin Roy John, who in 1978 brought Valdes-Sosa to NYU’s Brain Research Lab as a postdoc. The neuroscience center is now part of state-owned BioCubaFarma, a combination R&D, manufacturing, public health, and export enterprise with a workforce of 22,000, according to Cuba’s official press. Among BioCubaFarma’s triumphs are early detection of hearing loss in infants, the manufacture of hearing aids using 3-D printing, and a vaccine against lung cancer recurrence that is now undergoing clinical trials at the Roswell Park Cancer Institute in Buffalo, N.Y.
“Now that the animosity is drifting away we can learn from each other,” Valdes-Sosa told students and faculty at the University of Southern California in February. Because the two systems are so different, collaboration may not be easy, Valdes-Sosa acknowledges. He contrasts Communist Cuba’s tradition of translational research, which moves new medical technology, techniques, and drugs as quickly as possible into primary healthcare, with the typical capitalist-world practice whereby companies use the results of government-funded basic research and develop those that promise profits. The upshot of the West’s approach, he contends, is that medical advances end up serving just the more prosperous 20 percent of the world population. “Cuba does not have the luxury of having research institutions to do [solely] basic research,” he says. “It will take a lot of intelligence” to make collaboration successful, he told the USC audience. One place to start would be “low-profit things” badly needed for global health, with R&D funded by philanthropies. An example might be screening for diseases or for cognitive risk of dementia. He cites as a model Cuba’s production of a meningitis vaccine, packaged in Brazil, after the World Health Organization was unable to interest a Western company in doing it. A joint effort leading to a better understanding of the Zika virus would be a “no brainer,” he says. He also has suggested a Cuba-based international climate center. Travel restrictions that inhibited U.S.-Cuban collaboration in the past worked both ways, with the United States denying visas to Cuban researchers and Cuba at times denying its own scientists permission to leave. Iturria was invited to New York in 2010 by researchers whom he had assisted long distance, but “the Cuban side didn’t allow me to go,” he says. Cuba has hardly lacked for international partners, however. Europe, particularly Spain and Belgium, has active research collaborations with Cuban institutions. So does Canada, where Iturria is now a postdoctoral fellow at McGill University’s Montreal Neurological Institute, and China, where Valdes-Sosa has set up the Neuroinformatics Collaboratory at the University of Electronic Sciences and Technology. Despite her wariness, Solo sees “so much opportunity to help the U.S.” by studying Cuba. Engineers not only could explore such environmental questions as the impact of sewage discharge on coral reefs, but take an “outside the box” approach to redevelopment. Since Cuba lacks much in the way of car-based transportation infrastructure and now has an outdated, polluting energy system, the country could serve as a laboratory for leap-frog technology emphasizing light rail and small-scale, net-zero energy communities. Mark Matthews is editor of Prism. Hannah Berkeley Cohen contributed to this report from Havana. Cover image courtesy of Ernesto Oroza.